Humbolt Bay is located the north coast of New Guinea near Hollandia (Jayapura). Borders Cape Soeadja. To the east is Hollandia (Jayapura) and beyond the Cyclops Mountains and Tanahmerah Bay. Prewar and during the Pacific War known as Hollandia in Dutch New Guinea in the Netherlands East Indies. Today known as Yos Sudarso Bay, in honor of Indonesian Admiral Yos Sudarso who was killed during 1962 in a naval engagement against the Dutch at Vlakke Hoek (Etna Bay). On September 28, 1909 a Dutch navy vessel commanded by Captain F. J. P. Sachse landed at Humbolt Bay near the mouth of the Numbay River and established a camp named Kloofkamp at this location. At the eastern end of Humbolt Bay the Germans had established a settlement known as Germania-Huk (German Corner) that was later abandoned. On March 7, 1910 the Dutch established Hollandia with Humbolt Bay providing access to the sea. During April 1942 occupied by the Japanese Army and used as a Japanese anchorage. On April 22, 1944 during "Operation Reckless" the U. S. Army 41st Infantry Division made an amphibious landing at Humbolt Bay on beaches code named White Beach 1, White Beach 2 and White Beach 3. 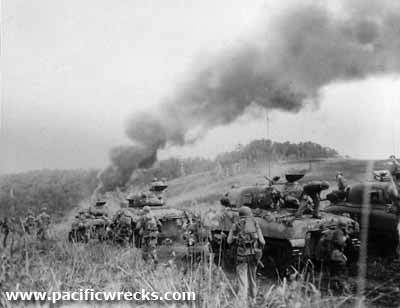 Afterwards, Humbolt Bay became a major American staging base area and for other amphibious operations in New Guinea and the Philippines. On April 22, 1944 the U. S. Army 162nd Infantry Regiment landed at White Beach 1 and met only minor resistance. Quickly, they secured the heights overlooking Hollandia. Immediately, supplies were stacked onto the beach, cramming the area with cargo. 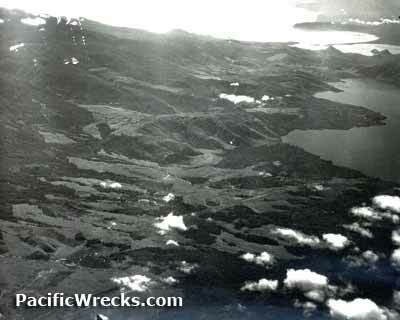 Meanwhile, a single Japanese bomber managed to slip thorough the mountains to the south, avoided American air cover and appeared over White Beach 1. This aircraft dropped four bombs, one scored a hit on an ammunition dump, that in turn set a nearby gasoline dump on fire. Today, this area is known as "Tanjung Ria Beach" and is a popular beach with resorts and facilities. 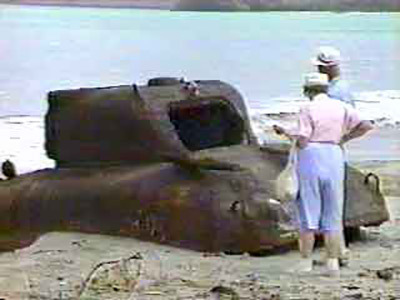 There are a few rusted hulks of American vehicles either disabled or abandoned on the beach. On April 22, 1944 the U. S. Army, 186th Infantry Regiment, 3rd Battalion made an unopposed landing at this location. On April 22, 1944 the U. S. Army, 186th Infantry Regiment along with the Regimental Cannon Company landed at this location and overcame slight resistance. In total, the Americans suffered six dead and 16 wounded, while the Japanese lost 48 killed an others were taken prisoner. On January 12, 1945 during the early morning, Japanese submarine I-47 entered Humbolt Bay and successfully launched four Kaiten manned torpedoes piloted by Kawakubo, Muramatsu, Sato and Hara beginning at 4:15am at 5 minute intervals. At 5:21 a single explosion rocked the anchorage, damaging the Liberty ship USS Pontus H. Ross. The three other Kaitens failed to do any damage. "Coincidences like this keep amazing me; who would have thought I would live so close to where part of a ship was buried that was torpedoed in the same bay where our troop ship was anchored! It has taken me almost 60 years to find out what actually happened the morning of January 12, 1945 when we were jolted out of bed. I have tried to find the ship's log for the Holbrook, only to discover that all such logs were destroyed in the 1950's. The concrete filled bow of this ship is one of many buried in a Liberty Ship Memorial Park, Oregon on the southern bank of the Willamette river between the Freemont and Broadway bridges on Naito parkway."